Choosing the right sweet potato for yourself can be confusing with the number of sweet potato varieties available on the market today. Here’s a little bit about each variety that will hopefully help you narrow down which sweet potato is right for you! Garnet – Deep Red to purple skin with bright orange flesh. Being high in moisture these sweet potatoes are great for mashed dishes as well as being used in cakes, pies and breads. Purple – Also known as the Stokes Purple Sweet Potato. It has purple skin and purple flesh that gets darker when cooked, it is used for roasting and other applications. It is firm and dense with a lower moisture content than other sweet potatoes, and it is has a different taste with less sugar content. 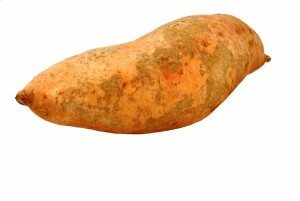 Jewel – This is an old variety of Sweet Potato, with rosey skin and bright orange flesh. They are good for baking and roasting and are moist and bright colored when baked. Jersey – The Jersey is an “old fashioned” Sweet Potato and is the variety most often associated with the term Sweet Potato, they have light yellow to white skin and light creamy white to yellow flesh. It has a sweet and creamy flesh that is a little mealy but holds up its shape well when cooked. Beauregard – The Beauregard has red-orange skin and light orange flesh. Moist flesh, great for baking. Japanese – The Japanese sweet potato has a delicate thin reddish-purple skin and white to yellow colored flesh. With a subtle sweetness and a nutty flavor they are great for roasting and are used in the production of sochu. Okinawa Purple – The Okinawa Sweet Potato has a light brown skin and a deep dark purple flesh. It retains its color when baked and has a delicate sweet flavor that can be served with many different kinds of dishes.